Made using naked barley from Nagasaki Prefecture. 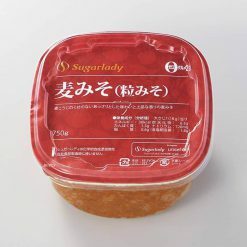 Contains mugi koji, resulting in a flavor that is less sweet than other barley miso. Each container is 750g and arrives frozen. Miso is made made from fermented soybeans and a few other ingredients, and can be used to make soups and sauces. This miso has been allowed to mature for about 4 months. (Maturation periods differ depending on the ingredients and the region, but for barley miso it is generally 2 to 3 months). Naked barley is a variety of barley that is cultivated in temperate regions (China, Shikoku, Kyushu). Because it does not do well in the cold, not very much naked barley is produced domestically in Japan. The koji ratio for barley miso: 220% (The koji ratio of miso is the ratio of soybeans to koji in the ingredients. The koji ratio = the weight of koji materials used ÷ the weight of soybeans used × 10). The higher the koji ratio, the sweeter the miso tends to be. 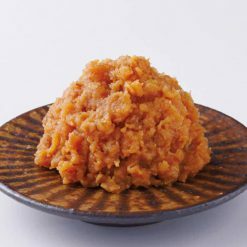 Our popular “koshi miso” has a koji ratio of 100%. This product contains naked barley (Nagasaki Prefecture), soybeans, table salt, ethyl alcohol.. Origin of ingredients: barley (domestic), soybeans (Canada). Prepared and packaged in Japan.